The closer it gets to Spring, the happier I get! March’s 360°Life is called My Happiness and it is full of bright, beautiful, happy colors! It’s 40% Off through March 19th at both The Studio and Gotta Pixel! FREE WITH PURCHASE! Receive 4 Quickpages with the purchase of this collection. This item is exclusive to this collection and will not be sold separately. Sharon made this gorgeous word art cluster for you all, I hope you enjoy! I am re-releasing my kit, Rainy Day Blues, I did add a few extras for you all. I love the colors, with the watery blues and rich greens. So perfect for all those rainy day layouts. Sign up for my Newsletter for more exclusive freebies! Tagged 360Life, aqua, blue, brights, green, hot pink, multi brights, teal, yellow. Lovely cluster Sharon, thank you! 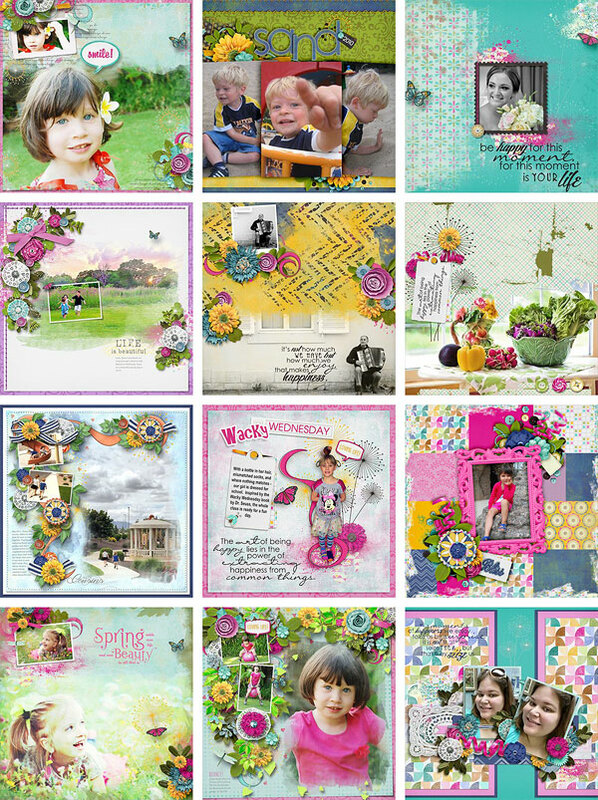 The March collection is very colorful; perfect for Spring! Thanks for the pretty cluster.